The Sustainable Development Goals place new demands on the statistical systems of developing countries, but support for statistics in developing countries has been lagging. A recent report by the Global Partnership for Sustainable Development Data places the current funding gap for statistics at roughly $350 million, while PARIS21’s PRESS2016 report shows that global support for statistics has declined in recent years. Furthermore, only 0.25 percent of official development assistance is dedicated to statistics. To meet the demand for more and better data embodied in the SDGs, increased, sustainable funding for development data is needed. Where will new funding come from and how will it be delivered? A large part will come from countries’ budgets, but many low- and middle-income countries will need additional official development assistance along with grants and support from foundations and other non-governmental agencies. Our recent report, Aid for Statistics: An Inventory of Financial Instruments, updates our 2015 report on the sources of financing for statistics. It includes a detailed inventory of financing mechanisms currently in use. Aid for Statistics draws on a survey sent to multilateral institutions and selected bilateral donors and private foundations asking them to describe the amount of financing and the mechanisms used to provide aid for statistics. The 2016 report contains expanded coverage of multilateral development banks, intergovernmental organizations, bilateral donors, and private foundations. These actors will continue to be critical players for developing the capacity of national statistical systems worldwide. Table 1 shows the annual value of financing provided by these donors. Total aid for statistics reported by participants in the 2016 survey was $327.85, but funding from several important donors decreased. For those included in both the 2015 and 2016 surveys, aid decreased from $264.2 million to $235 million. About $92 million came from donors not included in the 2015 survey. Additional aid – estimated to be around $135 million – was provided by organizations that did not respond to the survey. What are the most common financial instruments used to fund statistics? Bilateral grants and multi-donor trust funds are the most common instruments used to fund statistical programs. Table 2 compares the value of support provided in 2015 and 2016 by the financial instruments used by host agencies. The increase in multi-donor trust funds and bilateral grants reflect, in part, the inclusion of additional host agencies/donors in the 2016 survey, along with updates to funding of particular instruments. While total aid for statistics has decreased, funding through multi-donor trust fund and bilateral grants has significantly increased. Although the principal mechanisms for funding statistical programs were multi-donor trust funds, aid for statistics remains a very small part of trust fund portfolios. To put support for statistics in perspective, consider this. In the fiscal year ending in June 2016, the paid-in contributions to all World Bank trust funds were $3.17 billion. 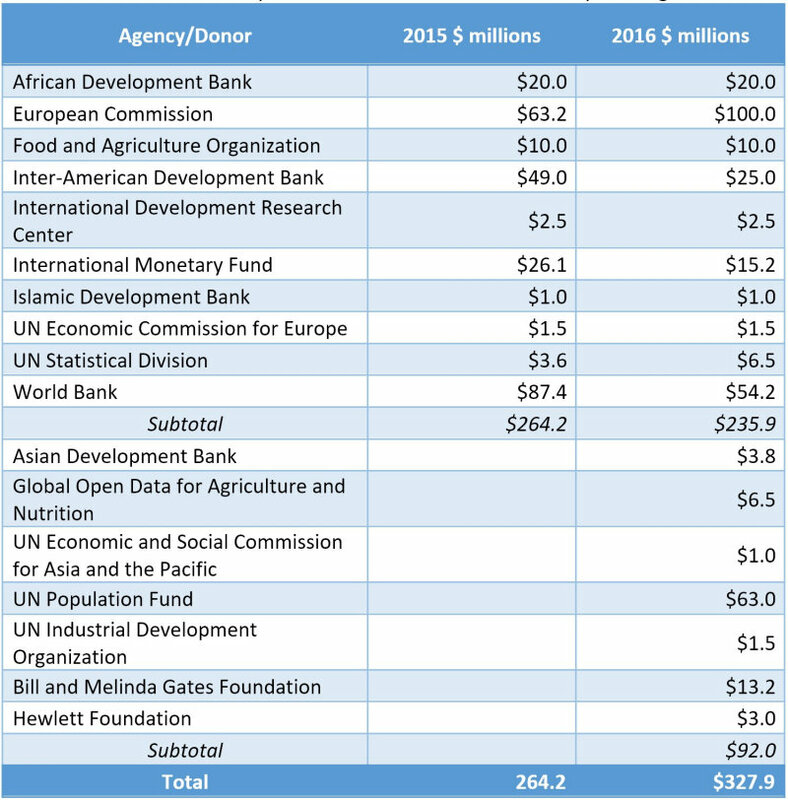 Referring back to the 2016 Aid for Statistics report, the annual funding for statistics from World Bank multi-donor trust funds was $40.83 million. Make data one of the pillars of topical trust funds, such as World Bank’s Umbrella Facility for Gender Equality. Resources for Data: Transformative Opportunities?